1 edition of The Last Christians found in the catalog. Add another edition? 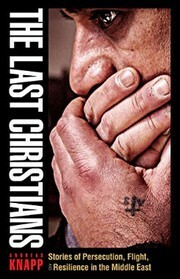 Are you sure you want to remove The Last Christians from your list? Published September 1, 2017 by Plough Publishing House . Inside Syria and Iraq, and even along the refugee trail, they’re a religious minority persecuted for their Christian faith. Outside the Middle East, they’re suspect because of their nationality. A small remnant of Christians is on the run from the Islamic State. If they are wiped out, or scattered to the corners of the earth, the language that Jesus spoke may be lost forever – along with the witness of a church that has modeled Jesus’ way of nonviolence and enemy-love for two millennia. The kidnapping, enslavement, torture, and murder of Christians by the Islamic State, or ISIL, have been detailed by journalists, as have the jihadists' deliberate efforts to destroy the cultural heritage of a region that is the cradle of Christianity. But some stories run deep, and without a better understanding of the religious and historical roots of the present conflict, history will keep repeating itself century after century. September 12, 2017 Edited by Todays Martyrs Reviewer Edited without comment. September 12, 2017 Created by Todays Martyrs Reviewer Added new book.